Nature of Why- British Paraorchestra - Photo Credit - Paul Blakemore. Southbank Centre’s Unlimited Festival is back this summer – from the 5 – 9 September! We are excited to see it all taking shape as Southbank Centre announce their first wave of programmed work for the 2018 festival. Unlimited Programme Coordinator Isabella Tulloch takes a look. 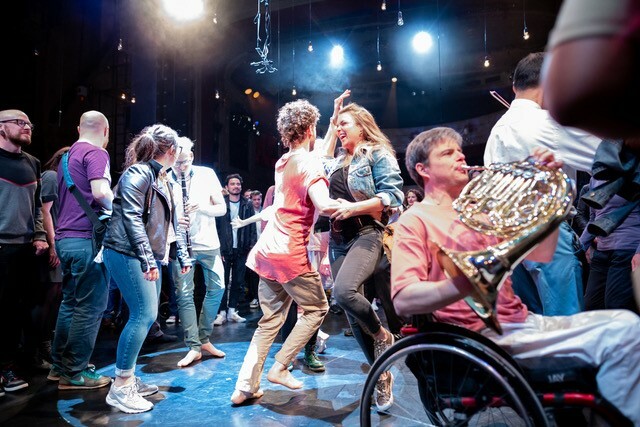 Starting the festival off with a bang on Wednesday, we have the British Paraorchestra’s The Nature of Why, which received rave reviews at its premiere at Mayfest, Bristol. An immersive fusion of live music and dance, inspired by the theoretical physics of Richard Feynman, with a brand new cinematic live score from Goldfrapp’s Will Gregory, and an ensemble of musicians and dancers. On both Wednesday and Thursday we will see Kaite O’Reilly’s And Suddenly I Disappear: The Singapore/UK ‘d’ Monologues – an engaging theatre collaboration between the UK and Singapore, examining a dialogue of difference, diversity and what it is to be human, from opposite sides of the world. On Friday Indian maestro Baluji Shrivastav takes over the recently re-opened Queen Elizabeth Hall and presents Antardrishti – InnerVision, a production inspired by the Bhagavad Gita, which examines what is sight and sightlessness. Outstanding blind musicians and dancers from throughout India have collaborated with Inner Vision Orchestra, Britain’s only blind orchestra comprising international musicians, and innovative digital artists Addictive TV, who create music you can see – a fantastical performance not to be missed premiering at Southbank Centre. Saturday will be filled with activity, starting off with Caroline Bowditch’s The Adventures of Snigel, a curious snail on an interactive adventure. A truly engaging performance for young audiences and adults alike, for under-fives and their families which we commissioned in partnership with Northern Festival Network back in 2017. Jackie Hagan’s This Not a Safe Space joins the bill for Saturday. Benefit cuts are hitting disabled people the hardest. Half of people in poverty are disabled or live with a disabled person. The future looks grim, so how can we get people to sit up, listen and care and not keel over with empathy-fatigue? Award-winning poet, playwright and stand-up comedian Jackie Hagan’s way has been to make a solo show that features the real voices of proper skint disabled people who she’s got to know in and around Manchester. Saturday night kicks off with Fittings Multimedia Arts’ take over of the Clore Ballroom with the Unlimited House of Krip – Vogue Ball with vogue ball shows, workshops and screenings. A short documentary, produced in partnership with First Take Film and Media, will also be screened that follows the creation of the House leading to their debut performances. The company has researched the history of the balls and their celebration of diversity and difference and compared this to the lives and experiences of the members of The Unlimited House of Krip. On Sunday come along and join Viva Carnival and the Alegria Samba School, have collaborated with Embaixadores Da Alegria, Rio’s largest disability-led samba school, for an afternoon of carnival activities. Spend the afternoon creating costumes and join in with the outdoor performance in the Brazilian style. Sunday evening there will be the dance double bill with Aby Watson’s –ish and Dan Daw’s On One Condition, which both explore identity and disability. –ish is a fantastic choreographic performance using movement, text and objects to explore the murky territory that dyspraxia inhabits between able / disabled. Made and performed by a dyspraxic artist, -ish is a performance of real effort (and real chaos) which represents dyspraxia, unapologetically, as thriving and flourishing on dys-function. Dan Daw’s On One Condition reflects on growing up in rural Australia and his journey to having a successful international dance career. The works announced so far are going to create such a dynamic discourse, we can’t wait to see what else joins both the ticketed and free programmes for the festival. Best get booking your tickets now!